Landscape Design Ideas and Beautiful Photographs by a 30 Year Professional. A Landscape Design is a Plan for Success! The first step in creating a beautiful outdoor environment is to develop the plan - THE LANDSCAPE DESIGN. Whether your project is large or small, simple or complex, a plan keeps you on track and saves you money. Landscaping is an investment in your property that grows more valuable each year. Create it right the first time! I want to share my 34 years of experience with you. My work has been primarily in the residential sector, but I have done plenty of commercial projects. There are many aspects of developing the grounds for a property that are only learned by doing. I want you to be able to gain this extra depth of knowledge from this web site. Explore these pages to learn the process of developing beautiful gardens for your property. This information is valuable to the do-it-yourselfer or the person who is preparing to hire a professional. Time spent planning and designing your landscaping pays off! The best plants for your property and climate are used. Thought is given to the needs of the site and the best look to suit the architecture of your home. Personal preferences and budget are taken into consideration. Creative landscaping creates wonderful spaces for many uses and adds beauty and value to your property! The landscape design is the starting point to making it happen. Sit back and enjoy this web site of beautiful pictures and valuable information. Nancy Dransfield, Landesign of Virginia, Inc., P.O. Box 15582, Richmond, Virginia 23227, Office: 804-261-6773, Fax: 804-264-7253, E-mail: n.dransfield@verizon.net. Landscape Design Samples from Start to Finish Illustrated with Pictures! Cottage Gardens are Colorful and Delightful! Woodland Gardens have unique site conditions that offer wonderful opportunities for a shade garden! Patios Make Being Outside Easy! Pretty Patios are Powerful Places! Design your Driveway to Make an Impression! Choose the Best Driveway Surface for Your Property! A Circular Driveway Makes a Beautiful Approach! U-Shaped Driveways Are a Tried and True Design That is Very Popular! Parking areas at your home should not look like the parking lot at the mall. Make room for cars without ruining your landscape while adding interest and pizzazz. A Swimming Pool is the Ultimate Back Yard Accessory! Design Tips For a Spectacular Swimming Pool! Fiberglass Swimming Pools are Low-Maintenance! There are Good Reasons to Consider a Fiberglass Swimming Pool! Gunite Concrete Swimming Pools are Considered the Finest! Gunite Pools can be Any Shape or Color! Vinyl Liner Swimming Pools Are Affordable and Strong! Vinyl Liner Swimming Pools are Soft to the Touch and to Your Pocketbook! Pool Decks are a Place to Relax and Play! Perfect Pool Decks are Stylish and Comfortable! Fences Can Create Attractive Boundaries! Fences are often a required part of your landscaping, but they do not have to be boring or unattractive. Integrate them into your landscape plan properly for marvelous results! Garden walls are permanent structures with limitless possibilities. See and learn how these garden walls have made their owners spectacular outdoor rooms! Retaining Walls Embrace the Land with Style! Build retaining walls to terrace a hill or provide support to a steep slope. Design them to impress your visitors and endure the elements! Outdoor Fireplaces Add Warmth and Excitement to Your Home! Outdoor fireplaces create a warm, cozy gathering place and an exciting focal point! Do Outdoor kitchen design and construction right! The process is full of details that you can learn here. Waterfalls Splash Up Your Landscape! Design and Build Waterfalls that Work! Harmony Park is an outdoor musical play ground full of incredible percussion instruments. Front Yards that make a lasting first impression! Back yards are a place for fun and relaxation! Personalize your back yard and make it unique. This is your private space to ponder and enjoy! A small yard is charming, but challenging. A different approach is necessary to successfully design one. Steps are functional, but also are a design element. Learn the tread/riser formula for designing steps that are safe and beautiful! Pergolas provide shade and are beautiful structures that add a wonderful architectural detail to your landscape! Green Landscape Design is Smart! Green Landscape Design is energy and resouce conscious. Conservation is considered when developing a green landscape plan. Your beautiful house stands alone with all the hardscape installed. It is not finished until you do the planting design. Come learn the essentials! Landscape Lighting Gives Dazzling Results! Improve the night time street appeal of your house by adding impressive landscape lighting that is designed to show off the fine points of your home and grounds. Landscape Plants Provide the Finishing Touch! How to Understand the Basic Types of Landscape Plants. Perennial Landscape Design Ideas and Plants for Zone 7. Landscape Maintenance Ideas for Easy Care! Landscape Maintenance does not have to be overwhelming. Organize it with the help of your landscape plan for and organized approach and wonderful results. Do Not Let Pruning Intimidate You! Do not let pruning intimidate you!. Learn the plant basics for accessing your pruning needs. Get all the information you need to know to do a great job. Nancy Dransfield, an Experienced and Respected Landscape Architect! Learn about Nancy Dransfield's years of experience in landscape design!! A Directory of Favorite Links For Landscape Design and Gardening Enthusiasts. 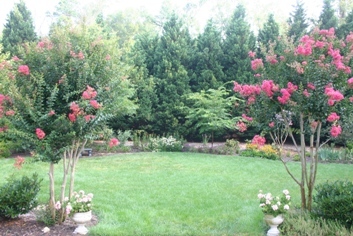 Contact Me, Nancy Dransfield, Landscape Architect and owner of Landesign of Virginia, Inc. Ask the Expert about your Landscape Design Problem or Concern. I Want to Help! Get Published! Send Pictures of Your Beautiful Landscaping! Get Published Free! Send pictures to show off your great landscaping! You get your own web page to share with friends, family and the world. Site Build It has Brought Me Clients! Marketing my Landscape Architecture firm on the web with Site Build It has been the best form of advertising for my company. Summer weather demands heat tolerant plants. A swimming pool/pergola keeps you cool. Try the hot new product, Deck Over, to renew your salt treated wood and concrete.